More information: www.jvank.nl/ARMSelected Advising on research methods: Selected topics 2012 results from a research master course Methodological Advice that was given at the University of Amsterdam, fall 2012 by Don Mellenbergh and Herman Adr. The objectives of this course were: (a) to acquire methodological knowledge that is needed for advising researchers in the behavioral and social sciences, and (b) to get experience with methodological consultancy. 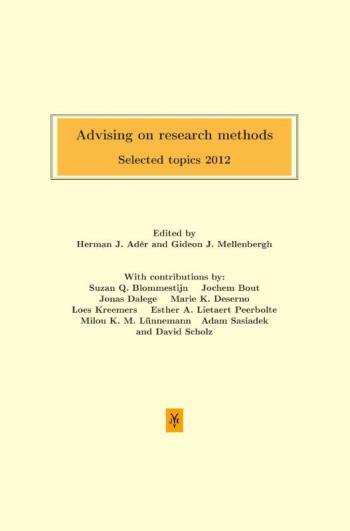 The main material for the course was the book: Advising on research methods: a consultant's companion by Herman J. Adr and Gideon J. Mellenbergh (with contributions by David J. Hand). The students had to fulfill various assignments, one of which was to write a paper on a topic that may come up during methodological consultancy. In the beginning of the course, paper topics were selected from a list of relevant methodological issues. The publication process of drafting, submitting, reviewing, adapting and correcting was the same as in the production of any other edited paper collection.